1 COMBINE tomatoes, onion, parsley and mint in small bowl. Season, if desired with salt; set aside. 2 HEAT olive oil in large nonstick skillet over medium-high heat. Season chick peas, if desired, with salt and pepper and cook, stirring frequently, until golden, about 4 minutes. Stir in garlic and cook until fragrant, about 30 seconds. Remove chick peas and set aside. 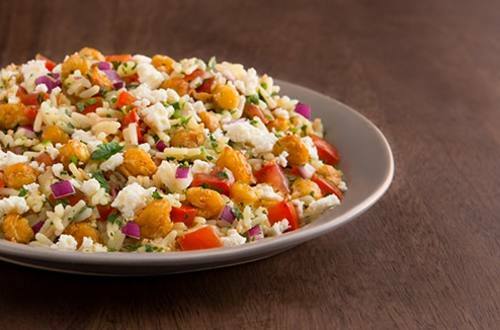 3 PREPARE Knorr® Rice Sides™ - Rice Pilaf in same skillet according to package directions. Stir in tomato mixture and chick peas and top with feta cheese.